I put off reading this for quite some time, because I thought it would just depress me. Strangely enough, it made it all seem kind of...normal. All while Kolbert and the scientists she interviews stress that this is very very not normal. Our oceans are being acidified, our global temperatures are rising, and we are almost OUT of Sumatran rhinos. But I did come out of it feeling that people are trying (and succeeding, at times) to do something about it. 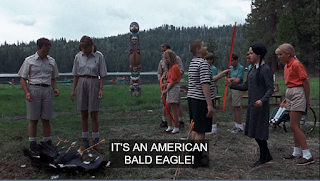 Remember how in the '90s bald eagles were almost gone? Now there are a bunch of them! Because people saw that they were screwing them over and then actively tried to fix it! The main culprit in these extinctions (or severe population depletions), aside from us just shooting things, seems to be our big dumb penchant for exploration. We've been moving flora and fauna from one landmass to the other for eons, with sometimes devastating effects. I'm not writing my congresspeople about maintaining the Great Lakes Restoration in the budget because someone DIDN'T introduce Asian carp into our waterways. Sometimes we don't even mean to introduce these things. A fungus in South America is killing all the frogs. It's covered in the book. 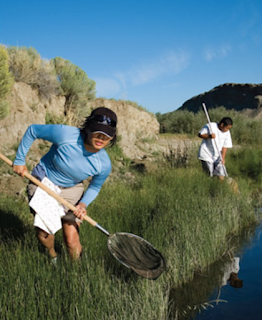 The only frogs from the area that're left are the ones captured by nerdy frog scientists. Thank God for people who care enough about disappearing frogs to go out in the hot hot sun and catch the few remaining ones. I am not one of those people. But bless you if you are. One of my favorite sections of Sixth Extinction deals with how we've actually been causing mass extinctions since we first set out exploring. Meaning there's been mounting evidence that the disappearance of megafauna (giant sloths, cave bears, etc) was due to humans showing up. Because of these large animals having a pretty slow reproduction rate, if we only killed about two a year in a certain area, they would, over hundreds of years, be on the definite path to extinction. To which I say, "How were we supposed to know! That's such a gradual extinction as measured by a person's lifetime! 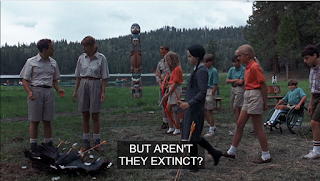 We're sorry, giant ground sloth!" Meanwhile, it appears that Neanderthals...didn't do this at all. Which just makes me feel poopy about us. 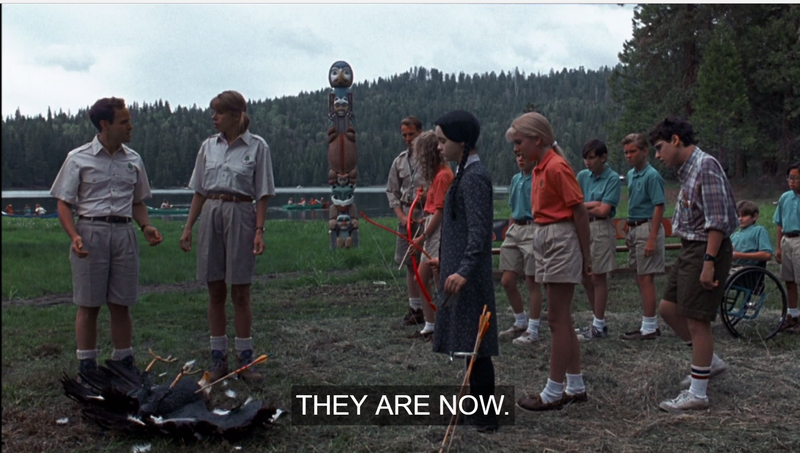 We are like the evolutionary equivalent of a stereotypical 1980s movie underdog character. 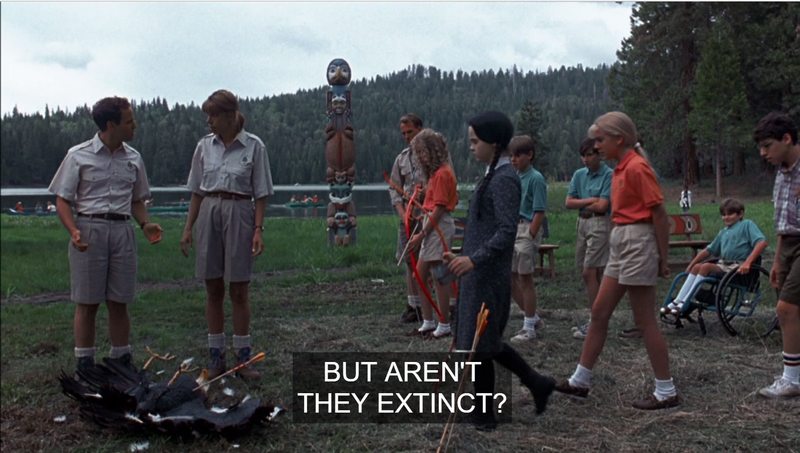 "Why d'you have to screw up everything you're given, huh, Human Race? You had it all handed to you. Oh, so now you're gonna find another planet and live there? Sure. Right after you get Sharon to go to prom with you." 5/5 stars. Loved it. Would learn about humans ruining the planet all over again for sure. Yes yes YES I know that I must read this soon. I read an ?excerpt? 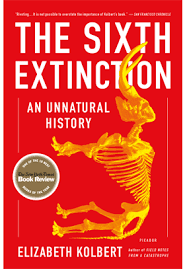 from it in the Best American Science and Nature Writing the year it came out, and it made me think completely differently about extinction as a concept. PS I saw a bald eagle one time in Louisiana.